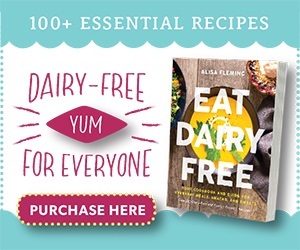 You are at:Home»Dairy-Free Recipes»Alisa's Recipes»Cheesy Dairy-Free Quinoa Bites: Healthy, Delicious Game-Changers! The folks at Bob’s Red Mill asked me to create a recipe that expresses how I stay on track with health goals. It’s been estimated that over 40% of Americans make at least one New Year’s resolution, but only 8% of us are able to stick with our resolution(s). I read somewhere that February 7th is the date when most people drop off. So how can we get back in the game and make healthy changes for the long haul? What works for me, is setting cumulative goals rather than daily goals. In 2016, I decided that I would average 60 minutes of activity a day, the amount we need to prevent unhealthy weight gain, over the year. This includes walking to running, active stretching to power yoga, etc. It all counts! I track how many minutes I get each day and shoot for 21,900 minutes of being active in the year. This means I can have lazy days. They’re compensated for by big hikes, ample summer pool time, or days when I’m feeling more energetic at the gym. It’s just doable, motivating, and something that I’m repeating this year! Food goals are a little trickier for me, since a lot of my daily diet revolves around recipe creation. But I do focus on balance rather than set goals, and I eat smaller meals made with whole foods. 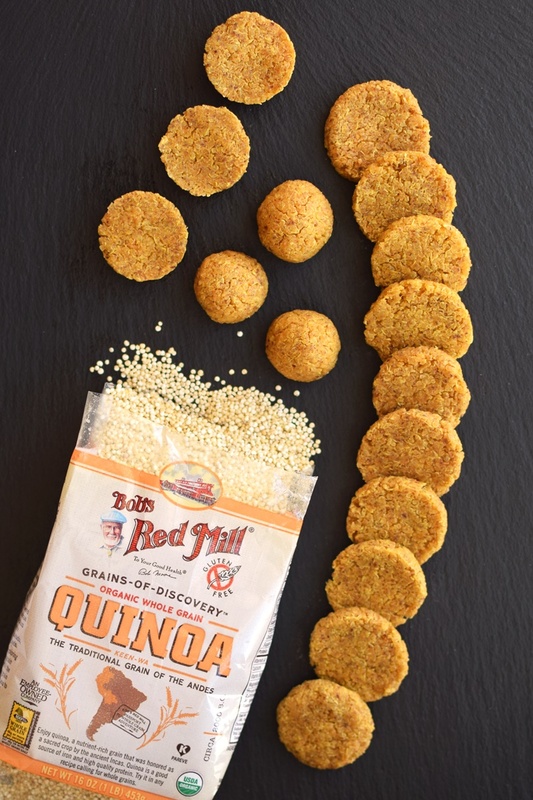 To make it convenient, I always keep healthy nibbles on hand like these cheesy quinoa bites. They’re perfect for a quick snack or for putting together a healthy veggie-filled meal in a flash. Freshly cooked quinoa releases sticky starches when given a whirl. The consistency is a bit like gluten, but without a speck of wheat or the need for other binders. Nonetheless, I do add a touch of ground flaxseed for good measure. 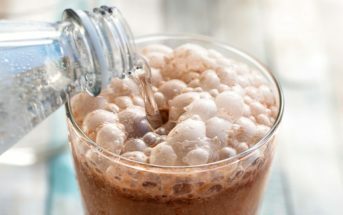 I think it just works for enhancing the texture and nutrition, while seamlessly integrating into the flavors. However, you can use ground chia seeds with similar results. The cheesy flavor comes from the combination of nutritional yeast, cashews, lemon, spices, and salt. I know that some of you are timid with nutritional yeast, so I’ve included an option for starting with a lesser amount. But don’t omit it! It does add to the texture and is the “umami” base for the cheesy flavor. Fortunately, its relatively affordable and lightweight, which means a 1-pound bag usually lasts for many recipes. Think of it like a seasoning that you might use generously. Tony and I actually like nibbling on these cheesy quinoa bites as is for a snack or side. I also love them atop salads, and in pitas instead of falafel. But they are the perfect match for dips or spreads. I topped them here with bruschetta, but they’re also amazing with red pepper spread, eggplant dip, dairy-free pesto, or olive tapenade. 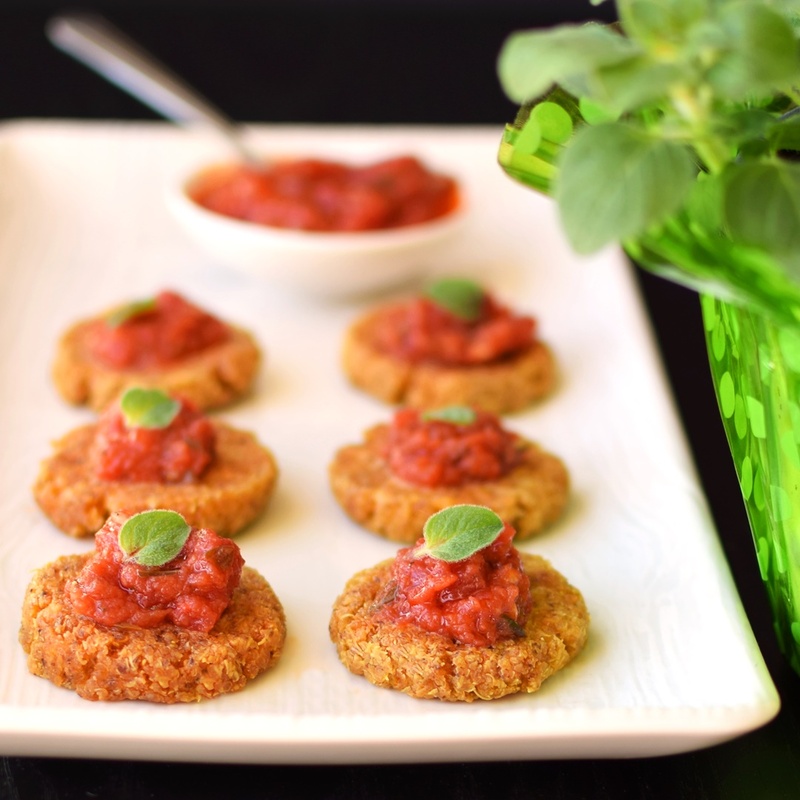 And for special occasions, they make a fun hand-held appetizer that your vegan, dairy-free and gluten-free guests can partake in, but that everyone will savor! As noted above, this post is sponsored by Bob’s Red Mill. However, I do purchase all of these products myself and use them regularly in recipes like these cheesy quinoa bites. For nut-free cheesy quinoa bites, I recommend swapping in sunflower seeds for the cashews, and grind them quite well. This isn’t an exact swap since cashews and sunflower seeds do have different flavor and consistency profiles, but should still work well. The key to this recipe is using freshly cooked, still warm quinoa. It releases its starches for wonderful binding power without the need for eggs, breading or beans! Put a pot of water onto boil, like you would for pasta. Thoroughly rinse the uncooked quinoa through a fine mesh sieve. Add the quinoa to the boiling water and cook for about 17 to 20 minutes, or until fully cooked. It's okay to cook it for a couple extra minutes. Thoroughly drain the quinoa through your sieve and return it to the pot (off the heat). Cover and let sit for 5 to 10 minutes. While that rests, place the nutritional yeast and cashews in your spice grinder or small food processor. Process until powdered, about 30 to 60 seconds. Place about 2 cups of the cooked quinoa in your food processor or high speed blender (I use my cheapy little Ninja cup and do it in 2 batches) along with the cashew mixture, flaxseed, oil, lemon juice, 1 teaspoon salt, paprika, onion powder, and garlic powder. Process until combined and relatively pasty, about 30 to 60 seconds, scraping down the sides as needed. You don't want to puree it completely, you should have a sticky mass with quinoa bits still in there. Add the sticky quinoa mixture to a bowl along with the remaining cooked quinoa and use a big spoon to thoroughly combine the thick mixture. Add the remaining ½ teaspoon salt (or to taste) and stir to thoroughly combine. Scoop by the level tablespoonful onto baking sheets or into mini muffin tins (no need to grease if they're non-stick). I use a tablespoon measuring spoon and literally scoop like ice cream and level off on the side of the bowl. Easy peasy and fast! Flatten the quinoa balls into rounds about ½-inch apart (they won't spread), shape into balls, or press down into the mini muffin tins. Bake for 25 to 35 minutes, or until done to your liking. They're nice and cooked at 25 minutes, but firmer and lightly browned at 35 minutes. Enjoy as is, with a dip or topping, on salads, in pitas, etc! Store covered in the refrigerator for up to 3 days, or freeze in plastic bags to eat later! *If you're timid with the flavor of nutritional yeast, start with just ¼ cup. You can always add more after taste-testing. **If you only have whole flaxseeds on hand, add about 1 tablespoon whole flaxseeds to your spice grinder with the cashews and nutritional yeast. ***I bake my cheesy dairy-free quinoa bites at 350ºF to avoid exceeding the smoke point of the coconut oil that I use. You can cook them at a higher temperature for speedier results. At 400ºF they cook in about 15 minutes, give or take. 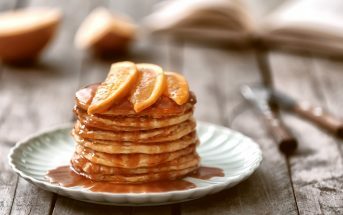 Just discovered your site and this recipe – it looks fantastic! Am making my first batch right now! I was wondering – you mentioned they can be made ahead of time and frozen. Do you have tips on how to best defrost them? Hi Jessica, honestly, when I’m lazy I just defrost them in the microwave 🙂 But they will be best if baked in a 350º oven until heated through and golden. This will preserve the texture for longer, too. You can also slow-defrost them in the fridge or even in a lunch box, if you don’t need them served warm. I hope you enjoy! These look so good and certainly better than any dairy version! I’m not a real big fan of quinoa, but with these and all their cheesy flavor and spices, I’m pretty sure I would devour the whole batch with no hesitation. Love how simple they are to make, too! 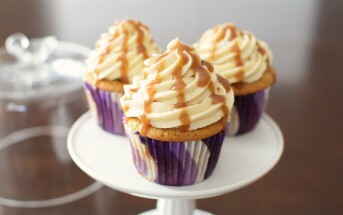 These look so good, Alisa! I love how quinoa can give a nice crunchy texture, and I’m thinking these must have a nice crisp bite. These are adorable and look amazing! I love that they are bite sized, because that means I can eat more! 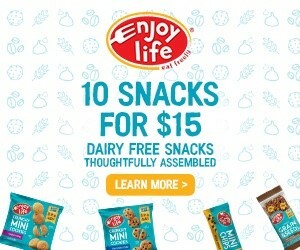 These little bites look so delicious! What a great way to use quinoa! 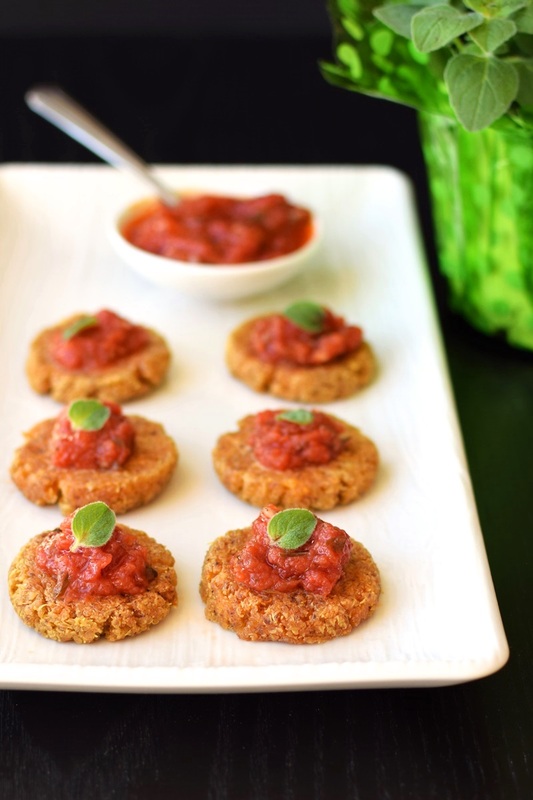 I love the idea of making quinoa bites! They look so perfect for parties! They really are Dianne, but a great everyday little item, too. We’ve had them for snacks and even as part of dinner – my husband loves them and he isn’t a huge quinoa fan. These are so cute! Perfect for little appetizers or even a light lunch. My kids would really like this too! Definitely! And I think they are quite kid-friendly. Ooh this looks so good! I love quinoa and anything cheesy! You and me both Becky! 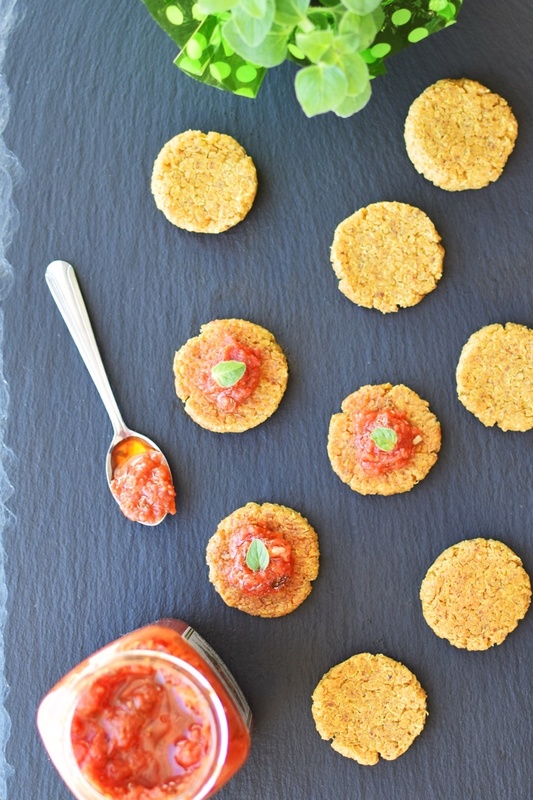 These cheesy quinoa bites look so delicious! They’re a perfect snack to keep on hand! These are the perfect little finger foods to feed my babies! YUM! 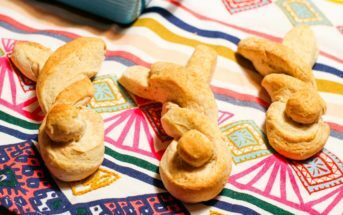 Oh yes, such a good idea – definite finger food for little ones too! I’m such a fan of the little bite foods. I know in theory they are great for parties, but for me they make perfect little mid-day snacks!!! Great combo with the protein of the quinoa! Me too Amanda. I like the little size so I can eat as many or as few as my body needs! These are so fun! Love all the bright colors in there too! Yep, they’re easy to dress up! And a pretty yellow-orange color on their own. These look so good! Perfect for a weeknight dinner, kids lunch, or even perfect party food! Pinned and cannot wait to try them. You’ll love them Sarah – I promise! These sound so so great. I hope to make these. Thank you for offering the tree-nut free suggestion. I was hoping my son had out-grown his cashew allergy, but recent testing showed he is still allergic. I have all the ingredients, so I will let you know how it works with Sunflower Seeds! I just love quinoa! It’s just one of those pseudo-grains you can use for almost anything. Can’t wait to try your recipe. Right? It’s got such a great texture for so many uses! These look delicious! I have been a bit hesitant about nutritional yeast, but I see so many great recipes with it, I’m going to have to look for it at the store! You really should try it Amanda. It’s a seasoning, not a flour – used in small amounts it adds wonderful depth and cheesiness. I love this idea! I bet the crunch from the quinoa is just perfect. These look so delicious! It’s been so long since I’ve made quinoa bites but these look way better! I bet these are a favorite with kids! Such a cute bite! No one turns down pizza in any form! Yes, I guess so – easily pizza bites!